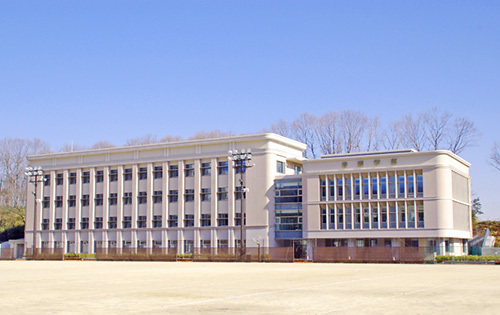 This two-story building is the largest cafeteria on campus. 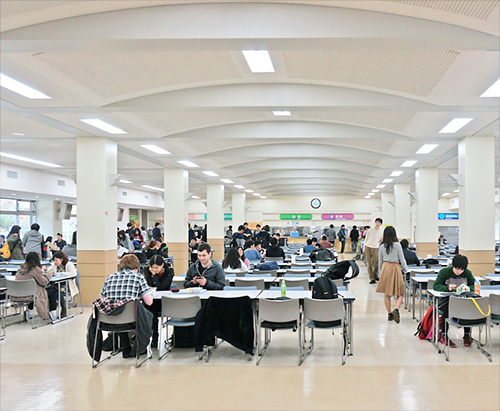 The menu offers a rich selection including set items and noodle dishes, and the cafeteria is always lively with students. 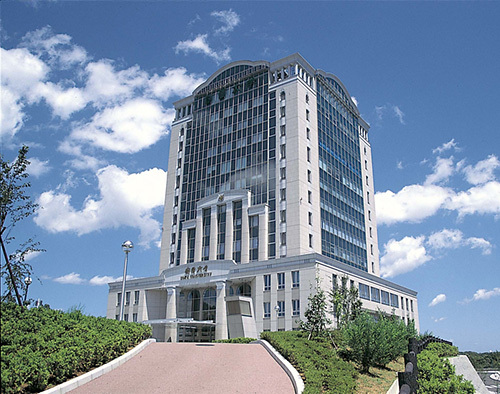 The general academic building with 12 above ground floors and 2 underground floors. It is a symbolic building with state of the art facilities and considerations for the environment. This building was completed in May 1999 and is 80 meters tall. In addition to classrooms, offices, and lecture halls, there is a café terrace which offers a great view. The founder’s footprints and the history of interaction with universities abroad are among things on display in this exhibition space. This open space rises up to the third floor. In addition to a large display panel, there are many accommodations for obtaining information. 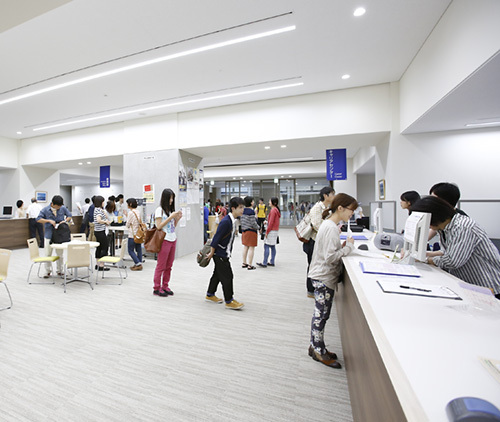 The convenience store LAWSON and a lounge are located on the B1 floor. 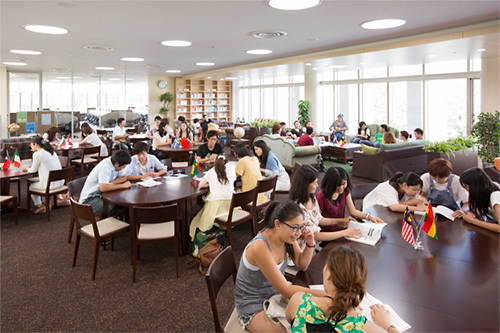 Since students can casually use the lounge, it is always teeming with activity. 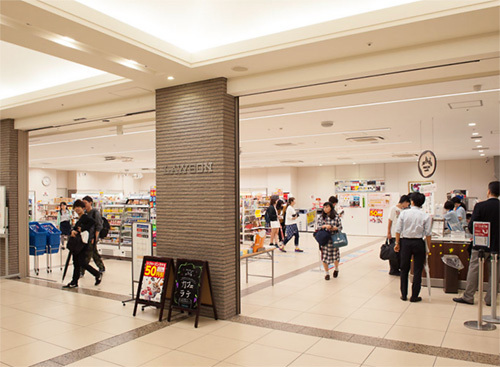 LAWSON, a convenience store, is located on the first basement level. You can purchase stationary and everyday items here. You can enjoy delicious soft drinks and sweets. The brightly-lit, relaxed space is optimal for connecting with friends. With “Supporting the students’ learning from 360°” as its core concept, this space facilitates undergraduates, graduate students, international students, and instructors making use of their own ideas and experiences to learn from one another. From questions regarding language study to problems that arise from daily life, worrying is a part of student life. SPACe has support staff who will work with you to solve such problems. You are free to discuss anything with them, for example, you can talk about how to make use of SPACe resources or you can talk about personal matters. This is a space that everyone should feel free to visit. This is a space that can be used in various ways. Everything from engaging in active learning with a few people and holding a group discussion to giving a presentation to a large audience is possible. The round space brings to mind an image of a coliseum. You are welcome to use this space as an area for study, and also for projects and events related to study. On the two walls, there are large whiteboards that can be used as a projection screen. Let your ideas come to life and use this space to hold research discussion groups for teaching staff, presentation competitions etc. By conversing with international students in a foreign language, you can deepen your appreciation of other cultures. It is a global space that offers a chance to experience studying abroad while remaining on campus. 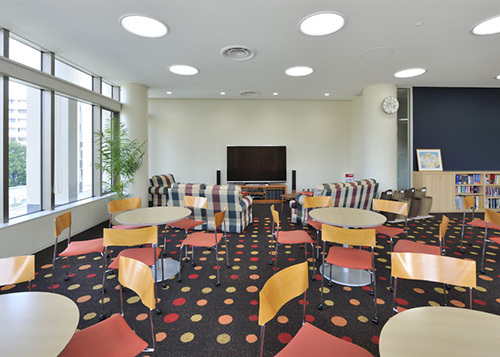 This is an “English Lounge” for intermediate level students. We will discuss substantial topics such as topics related to social problems to allow the students to develop their discussion skills. This class is suitable not only for those who are seeking to study overseas, but also for those who are interested in international news and business. This is an “English Lounge” for beginners. We enjoy English conversation practice and engage in daily English conversation in a casual atmosphere. An important feature of this lounge is that it has an atmosphere in which even those who find English difficult find it easy to participate. A hall with a seating capacity of 1,000. 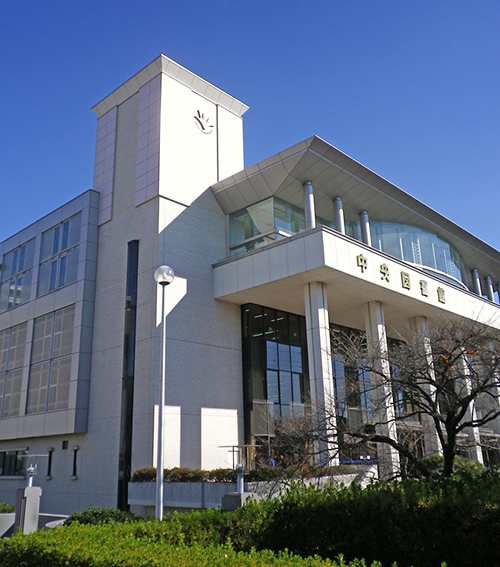 It is used for courses and public lectures. There are about 1 million books in its collection, and 170 PCs are available. Actual courtroom procedure is carried out in classes held in this mock trial classroom, with students acting as judges, attorneys, and prosecutors, including the mock civil and criminal trials which are required for third-year students. Seating capacity of 4,000. 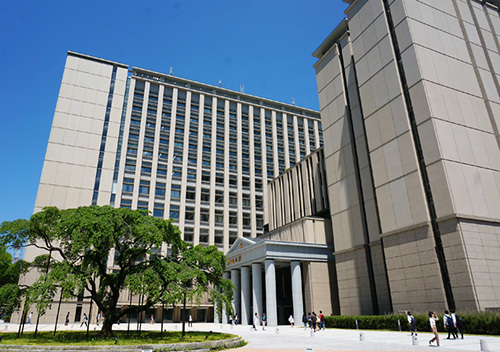 It is one of the largest university lecture halls in the world. Different classroom types are available depending on the mode of learning. They are designed to be adaptable to different student and teaching styles. 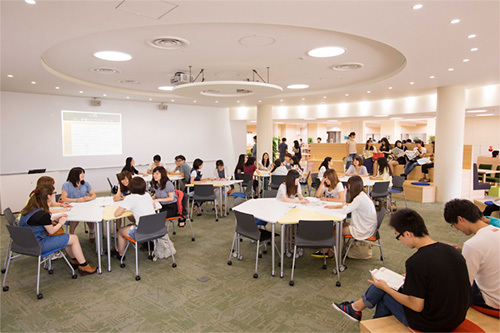 The classrooms in the headquarter building are primarily used by law department undergraduates and law school students for their classes. At the observation lounge on the top 12th floor, you can enjoy a wonderful view. Offices for the students’ association and the various clubs are located here. It was built on the west side of the main grounds in 2013. 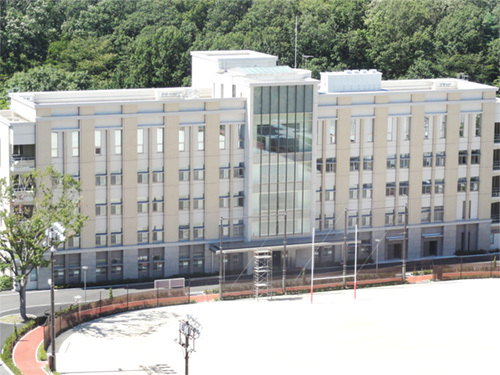 In addition to training classrooms for each topic equipped with the latest facilities, the building is also complete with a skill laboratory for improving nursing techniques, a meeting room, a library, and a study room.